If you are looking for a log home care specialists that can do it all, then look no further! 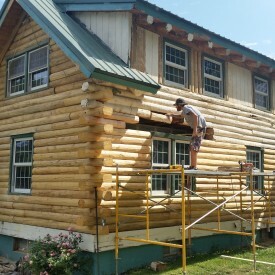 888-LOG-GUYS can be one and only log home company that you look to for assistance in restoring, repairing, protecting, and preserving your log home. 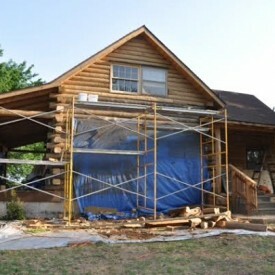 Look at our work on our website, and you will see the amazing transformations we have made with other log homes in the Augusta Kansas area. Go ahead, and give us a call! We will provide the information you need to make the best decision for your log home! For fading stain, peeling stain, and dark spots on your logs, ask 888-LOG-GUYS about restoring your log home. We start the process with media blasting the old stain and (per your request) sanding the logs to prep them for cleaning with a borate treatment. Next, (also per your request) we apply chinking or caulking on your log home, and then finally, stain the logs with a product (of our recommendation and) your choice. Our professional crews masterfully deliver our restoration services, and it is our mission to make sure you always feel comfortable with the process! Why are letting your logs break down and deteriorate? Why haven’t you called 888-LOG-GUYS to fix your log home? If it’s an insect infestation, if it’s mild to severe log rot, if it’s bird or woodpecker damage, if it’s water damage, or damage from severe weather, it doesn’t matter. We have experience repairing and replacing logs and even re-building whole walls! Find our work on our website or on Facebook, and you will see for yourself the amazing log home repair we can do for you! Don’t let gaps in between your logs let in water, bugs, or air drafts! Let 888-LOG-GUYS close those gaps and protect you and your family from nature’s harsh elements. You don’t have to put up with water leaks, insect invasions, or air drafts around your windows anymore! We know how to professionally install an energy seal that will close tight your log home, keep you cool in the summer and keep you warm in the winter. Don’t delay! Call us today to speak with an estimator! 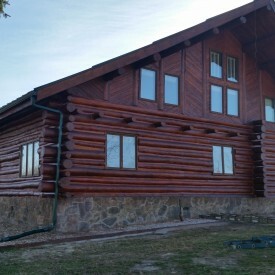 You love your log home in the Augusta KS area, right? But, is there something you would like to add onto it to make it more your own? Our crews can build structures for your log home that you may have only imagined before. Would you like a log staircase? We can build log staircases! Would you like a log railing? 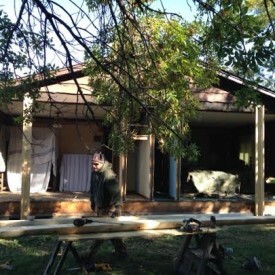 We can construct log railings for a loft! Would you like to add on a deck, porch, or patio? We can do that, too! Call us today with your ideas on how our log home construction will work for you! Once you are serviced by 888-LOG-GUYS, you have our guarantee that we will stick around for as long as you own the log home to maintain it! We have a professional staff to keep track of your maintenance schedule, and our crews will clean, re-stain, and seal your logs to keep them preserved for years to come! 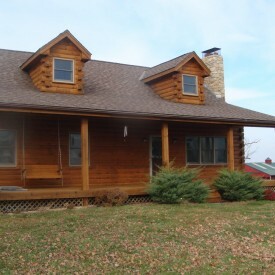 Trust the best log home maintenance professionals in the Augusta Kansas area for the upkeep of your log home! 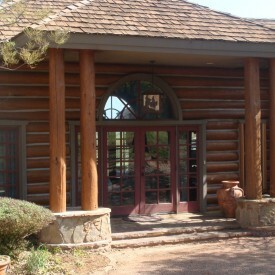 Ask to speak with an log home expert by phone or through our website!